The Toyota RAV4 Hybrid, the Prius SUV – What It Is? Time flew since Toyota launched the fashion of urban SUV with the first -generation RAV4 (1994), with its body 3-door sporty and compact dimensions. Toyota will return to this segment with the new C-HR within a few months. Meanwhile, the RAV4 4 has grown considerably and has become a family SUV placid has to fight in one of the most competitive segments of the market. Marketed since 2013, the fourth generation Toyota RAV4 experiences a deep restyling this year, similar to those given the Auris and Avensis last year. However, the most important change is not aesthetic, but their position in the market. With the advent of hybrid drive, the RAV4 leaving the familiar path of diesel and bet everything (or almost) the hybrid four-wheel drive. Can he convince the public of diesel? Aesthetically, the radiator grille is reduced to its minimum expression and the look is done with headlights feature LED technology for both daytime lights to the lighthouse itself much more acute. The new bumper design gives a more horizontal to the front aspect and visually refined with respect to the previous generation. In the corners, framed fog lamps stand in a triangle style Toyota Prius. Behind the new rear lights also with LED technology, the lower auxiliary headlamps, and the new bumper give personality contribute to one defense that no longer looks solid mass that had the previous generation. They are simple tweaks but that have contributed to radically transform the look of the RAV4. Evolution is undoubtedly even more significant under the hood. The 2.0-liter and 2.2-liter diesel yield place to a 2.0-liter D-4D 143 hp original BMW / MINI, which is only available in front-wheel drive 4×2 version. The 2.0-liter petrol engine of 151 hp from the previous generation remains listed though Toyota expects its sales are merely testimonial. The big news and Toyota brazenly bet therefore is the Hybrid version we could try in its version of four-wheel drive for a short period of time by the province of Toledo. Toyota, a leader in hybrid technology, markets for the first time the RAV4 in a hybrid version (after 4 generations, 21 years in the market and more than 6.5 million units sold). To do this, Toyota Lexus mechanics recovers NX300h: A 4-cylinder aspirated 2.5-liter Atkinson cycle 155 hp associated with an electric motor of 143 hp at the front train for a total power of 197 hp. 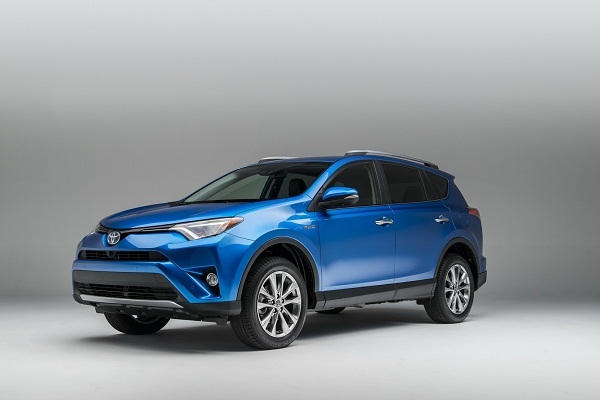 As standard, the RAV4 Hybrid is a front-wheel drive, but optional ($ 3,000) can be equipped with a comprehensive traction “e-Four” made up of a second electric motor of 68 hp at the rear axle (the overall power does not change and stays 197 hp, limited by battery). In both cases, the transmission is an automatic continuously variable transmission CVT. Those who usually drive a Toyota hybrid will be on familiar ground with the RAV4, others will have to adapt to the car. The RAV4 Hybrid is the most powerful and fastest model of the range with a 0 to 100 km / h in 8.3 s (one second less than the Lexus NX300h) and 80 to 120 km / h in 7 seconds, though not it is something that appreciates the wheel. Toyota engineers strived to erase all sense of speed to favor a linear power delivery and there is a huge difference between the throttle angle and load the 4-cylinder, although a specific engine mapping for, according to Toyota, “grant the engine more natural reactions.” Still, strong acceleration we still have the feeling of an engine that revolutionizes without that anger and force transmitted to the wheels. In order to make safe overtaking, it should be thoroughly humid the accelerator pedal. Prolog seems, but the pedal seems to have a cap, much harder than in an automatic use when we want to make a kick-down, to be overcome. The gearbox, with the sequential mode, does not change much to the situation, but at least, it gives you a little more control by reducing engine and you can have more brake. Toyota announces an average consumption of 5 l / 100 km. If you never anticipate or accelerate as we would a combustion engine car, it is possible to maintain the average consumption of RAV4 Hybrid around 6.7 l / 100 km. On the contrary, if we drive the RAV4 Hybrid as what purports to be, i.e. a car like any other will be difficult to get off the 8.5 to 9 l / 100 km. Still, leading to sedate pace, i.e. as will the client type RAV4 Hybrid, the car shows quite sparing in consumption as you realize that weighs almost 1,700 kg. Anyway, it is advisable to maintain a pace of quiet driving because the RAV4 Hybrid lacks any dynamism. The premium comforts here over any other consideration. On twisty roads, it tends to lengthen the path and does not have the accuracy you expect, plus the movements of the body are large. Seen this way, it is clear that the advantage of all-wheel drive is not to get out sooner a curve, but in the case of circular areas of reduced adhesion (rain, snow, dirt). We had a chance to try on dirt roads (eye with the exhaust line, very unprotected) on a private estate and e-Four wheel drive works, for the user, as a traditional Haldex. Under normal conditions, the RAV4 Hybrid is a front-wheel drive only when the front wheels slip, the rear motor drives the rear wheels and the central unit distributes the torque between the two axles. The presence of the second electric motor is not a change in consumption car weighing only 65 more than the 4×2-version kg. The greatest weight is offset by the undoubted and it brings in motor functions. Moreover, it is noteworthy that the transmission e-Four, the RAV4 Hybrid can tow a trailer of up to 1,650 kg when the trailer 4×2 version is limited to a weight of 800 kg. If you want a hybrid and compact SUV to carry motorcycles, jet-skis, a caravan or whatever, it is a proposal to be taken into account. Just inside the RAV4, restyling evolves occasion. The main differences can be seen in the use of new materials and plastics on board, intended to give a more premium. While the presentation is nice, if somewhat austere, the multitude of plastics of different touches and qualities inside a little disconcerted and away the premium desired look. Another novelty in the instrument cluster we now have a 4.2-inch multimedia screen, while the touchscreen in the center console becomes 7 inches. The habitability of the RAV4 remains a reference; in its segment, SEAT Azteca only seems to overshadow him. While in the rear, the RAV4 is still more generous than the SUV SEAT. The trunk, with a whimsical electric gate when opening and slow in general, continues to provide generous volume despite the second electric motor: 501 liters and 1633 liters with a single row of seats. Something, which moreover does not prevent keeping a double bottom in the trunk and even a spare wheel (in some finishes and trim 17). The restyling the RAV4 was also an opportunity for Toyota to equip it’s successful SUV in a series of active safety equipment christened Safety Sense. RAV4 pre-restyling recovers alert objects in blind spot and alert rear traffic and adds the active assistant inadvertent lane change (works very smoothly and effectively), the reader signs, System Security PCS pre – collision with pedestrian detection and automatic braking (up to 30 km / h) and active cruise control and a panoramic view (360 degrees) when we reverse to park. Notably, unlike other manufacturers, active safety systems are not exclusive to the highest finish. Indeed, with a range that starts at 29,890 dollars (Advance 2WD), the Safety Sense is available in the very equipped intermediate version “Feel! Hybrid” (audio equipment JBL 11 speakers, leather) by 32,990 in 2WD version and 35,990 in 4WD version, the range culminating in the finish Executive (sunroof) for 35,990 dollars and 38,990 dollars in 4×2 with all-wheel drive. Toyota estimates that 80% of the RAV4 will sell a year will be hybrids (of those, 40% in all-wheel drive), while only 18% will be diesel versions (only available in 4×2). It is a very risky bet by Toyota but enjoys a quality image and leader in hybrid models, which will reassure buyers. In addition, it is the only hybrid SUV in its class (Lexus NX and Audi Q5 move in another market segment), so that in the case of episodes of pollution in large cities such as Madrid, will be among the few cars allowed to circulate that day. The question is whether will convince even customers who have spent years with a diesel version and walk many kilometers a year not to go for a Honda CR-V or Mazda CX-5 offering more dynamic and attractive prices. You could even leave tempted by other models in the premium diesel segment as the BMW X1 or the Volvo XC60 (now the Swedish brand has a promo for the XC60 D3 150hp relatively well equipped). In short, the RAV4 Hybrid has a complicated but interesting task to convince the public that a hybrid can have the advantages of diesel without its drawbacks, especially in terms of emissions of NOx and maintenance. If Toyota’s trade policy is aggressive, you can convince many. In fact, if you do not do many kilometers a year and a relaxed drive, the Toyota V RAV4 Hybrid is a much more interesting option than diesel SUV everlasting.